When you think of a typical tech startup, what do you think of? Is it a bunch of twenty-somethings fresh out of university with computer science degrees, pitching their latest idea for a food-delivery service to angel investors or venture capitalists? If so, that’s not too far from the norm. And in that lies a problem: not every inventor fits into that culture. Because who we think is a tech inventor, and who we imagine is the market for a tech product, can limit the tech we get. Over the years, he’s done some amazing things as an entrepreneur: he rescued the British sports-car company, Aston Martin, from bankruptcy (the car made famous as James Bond’s preferred brand), and was chairman of the influential tech company National Semiconductor (now Texas Instruments). But now that he’s older, he’s dealing with the realities of aging. And among those challenges is the loss of his hearing. For Peter, the loss of his hearing is especially challenging, because he’s a serious audiophile. And most hearing aids, despite costing up to ten-thousand dollars, don’t do a very good job of translating the nuances of a live concert into high-fidelity sound. Moreover, being a man willing to acknowledge his own vanity, Peter wanted a way to hear music without appearing to everyone else that he was going deaf. So he set to work on his own version of a hearing aid, called HearGlass, which uses analogue microphones to record better sound. But the problem with building a high-fidelity hearing aid is that it’s cumbersome. So he’s using glasses frames to conceal the microphones and electronics. And the HearGlass features a clever tool called the “What” button, that allows users to play back the last few seconds of what someone just said to them. “I think we could sell them on that feature alone,” he says. 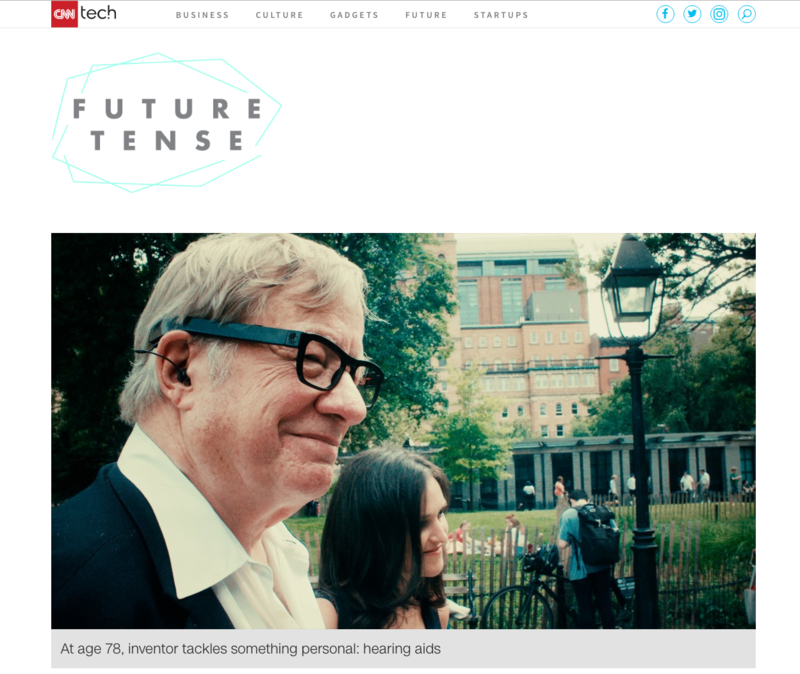 Peter hopes hearglass may address a cultural issue around hearing aids as well. “Men seem to be averse to buying hearing aids,” he says, suggesting they like to avoid things that are “billboards” for getting old. And he may have a point, especially when it comes to displaying age, because it turns out that his age counted as a big strike against him when he sought funding from venture capitalists. HearGlass is now on its fourth prototype, and is almost ready for commercial release. So what did Peter do? He turned to another, more receptive audience: his peers who also suffer from hearing loss, and raised money from other septua- and octogenarians who were willing to fund his venture. 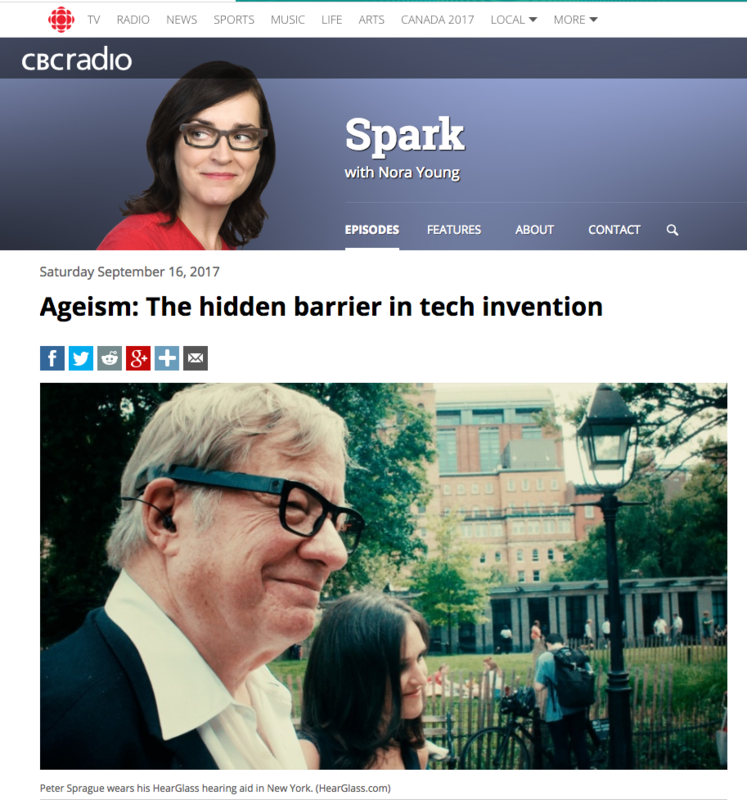 Facing ageism, and not having access to the traditional methods of financing and market a typical tech startup may face, Peter has also had to be creative in his attempts to get HearGlass to market. HearGlass is envisioning a subscription system where customers pay a monthly fee that would keep the technology up to date, and add new features as they become available. Primary Competitors Ripe for Disruption: 6 high-end HA makers with relatively stagnant technology and costly distribution. Interested in knowing more about this opportunity? Contact HEARGLASS now. Click Here. WASHINGTON – Hearing loss is a significant public health concern, and efforts should be made to provide adults with easier access to and more affordable options for hearing health care, especially for those in underserved and vulnerable populations, says a new report from the National Academies of Sciences, Engineering, and Medicine. The committee that carried out the study and wrote the report called for greater transparency and changes in the cost of hearing health care and expanded treatment options given the number of Americans who have hearing loss and the high cost of hearing health care. It recommended that the U.S. Food and Drug Administration remove the regulation requiring adults to have a medical evaluation or sign an evaluation waiver to purchase a hearing aid, as well as establish a new category of over-the-counter, wearable hearing devices – separate from hearing aids – that could assist adults with mild to moderate hearing loss. The report does not address surgical devices, such as cochlear implants, and related services. An estimated 30 million Americans have hearing loss, but only about 14 percent to 33 percent of adults 50 years and older who might benefit from hearing aids use them. It has been reported that high costs, lack of insurance coverage, the stigma associated with wearing hearing aids, and limited awareness of available options are often barriers to accessing hearing health care – which includes services to diagnose and evaluate hearing loss, auditory rehabilitation, and hearing technologies. In addition, the average retail price for a pair of hearing aids in 2013 was $4,700, which reflected the cost of both the hearing aids and professional services. Individuals cover nearly all costs associated with hearing health care. Third-party payment for hearing health care is limited, and the majority of employers do not provide hearing health care insurance. Medicare Part B covers only diagnostic hearing tests, not other services or technologies, although some Medicare Advantage plans do. Weighing FDA’s requirement for a physician evaluation prior to obtaining hearing aids against the rareness of medical conditions that have hearing loss as a symptom, the incidence of hearing loss in adults, the widespread need for hearing health care, and the wide use of the medical evaluation waiver, the committee found no evidence that the evaluation or waiver of that evaluation provides any clinically meaningful benefit. The committee recommended removing this regulation to serve consumers’ best interests. Relatedly, people should be able to obtain their hearing health care records to enable them to be better informed about their health and change providers if they so choose. Hearing technologies are rapidly changing, and lower cost technologies could potentially meet the demands of many adult consumers with mild to moderate hearing loss, the report says. Hearing aids – regulated by the FDA as Class 1 or Class 2 medical devices – are currently the primary set of devices used for the treatment of hearing loss, but people give numerous reasons for not using hearing aids, including their high cost, problems with fit and comfort, the stigma of looking old, and challenges with care and maintenance. Consumer electronic products termed “personal sound amplification products” are available and range in cost from less than $50 to more than $500 and may provide some or many of the technological features that hearing aids have. However, FDA guidelines note that these products cannot be marketed with the purpose of addressing hearing loss. Over-the-counter, wearable hearing devices could provide an additional easy-to-access and potentially less expensive option to meet the hearing needs of adults with mild or moderate hearing loss, and the committee recommended that FDA establish a new category of over-the-counter hearing devices. Hearing health care professionals should improve transparency in their fee structure by clearly itemizing the prices of technologies and related professional services to enable consumers to make more informed decisions, the committee said. It recommended that the Centers for Medicare & Medicaid Services evaluate options, including possible statutory or regulatory changes, to provide coverage so that treating hearing loss is affordable for Medicare beneficiaries. Furthermore, employers, private health insurance plans, and Medicare Advantage plans should also evaluate options for providing their beneficiaries with affordable hearing health care insurance. In addition, CMS should examine pathways for enhancing access to assessment for and delivery of auditory rehabilitation services for Medicare beneficiaries, including reimbursement to audiologists for these services. The committee found that the settings on many hearing aids can be adjusted only by hearing health care professionals who have an agreement with a given manufacturer or distributor to sell that brand of hearing aid, and many hearing health care professionals only sell one or a few different brands. As such, much of the direction of where to turn for help can be affected by hearing aid manufacturers and hearing health care professionals, which results in challenges for individuals who want to switch providers and for professionals who want to help patients seeking their assistance with a hearing device. The committee called for transparency of hearing aid programming, including the development and implementation of standards for hearing aid programming that allows any hearing health care professional to program device settings. It also recommended a requirement for point-of-sale information about hearing aids’ programming features and portability to be provided to consumers to enable them to make better informed purchasing decisions. Moreimproved compatibility and interoperability of hearing technologies with communications systems are also needed, because people with hearing loss frequently use hearing aids and hearing assistive technologies that couple with cell phones and a range of other communications systems. The report also provides steps to take to support and manage hearing health and foster environments that maximize hearing and communication for everyone. People can reduce exposure to noise that is at high volume levels for extended periods of time and use hearing protection as appropriate; be aware of and recognize difficulties in hearing and communication and seek information and care through the range of available services and technologies; and when appropriate, seek out peer-support groups and other opportunities for those living with hearing loss. In addition, community-based organizations, advocacy organizations, employers, businesses, and government agencies should promote work and community environments that are conducive to effective communication and support individuals with hearing loss. Specifically, they should ensure compliance with the Americans with Disabilities Act and other related laws supporting those with disabilities and strive to exceed their minimum requirements as well as research and incorporate features into buildings and public spaces that improve hearing and communication. The study was sponsored by the Centers for Disease Control and Prevention, U.S. Department of Defense, U.S. Department of Veterans Affairs, U.S. Food and Drug Administration, Hearing Loss Association of America, National Institute on Aging, and National Institute on Deafness and Other Communication Disorders. The National Academies of Sciences, Engineering, and Medicine are private, nonprofit institutions that provide independent, objective analysis and advice to the nation to solve complex problems and inform public policy decisions related to science, technology, and medicine. The Academies operate under an 1863 congressional charter to the National Academy of Sciences, signed by President Lincoln. For more information, visit http://national-academies.org. A roster follows. Copies of Hearing Health Care for Adults: Priorities for Improving Access and Affordability are available from the National Academies Press on the Internet at http://www.nap.edu or by calling 202-334-3313 or 1-800-624-6242. Reporters may obtain a copy from the Office of News and Public Information (contacts listed above). Barbara J. Evans, J.D., Ph.D.
Frank R. Lin, M.D., Ph.D.
Debara L. Tucci, M.D., M.S., M.B. A.